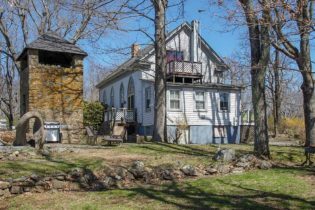 Historic Mountain Church converted to One-of-a-Kind Lodging! An opportunity of a lifetime for someone very special! The development of this unusual property is limitless. It begs the use of one’s own imagination! Once The All Saints Mission Church and one-room school, there are 3 buildings and long road frontage. This family estate was the home of Robert E. Kuhn where he lived pretty much as a recluse for the last 34 years of his life, while continuing his sculpting and painting. The “church” building has been converted to a whimsical 3 bedroom family vacation rental (https://www.vrbo.com/3966269ha that can only be described as “truly amazing”, with the entire interior of the “church” given over to colorful and imaginative original paintings, drawings, sculpture and furnishings! The stone “parsonage” building has additions that served as workshop/studio for Robert Kuhn’s metal sculpting and painting. The stone “activities” building was later turned into a studio/gallery complete with multiple skylights. Both the gallery and the “parsonage” building could become additional rental units if renovated. Or, an artist buyer might want to use the gallery for his or her own studio! The Sculpture Garden is a 2.75acre museum filled with fantastic, vibrant sculpture that can only be appreciated as you meander among them. Interspersed amid the art you might find a horseshoe pitching game and there are several spectacular sites for intimate weddings. Robert E. Kuhn was known for over fifty years primarily as a sculptor. He initially worked in wood, later in concrete & eventually exclusively in welded steel. He exhibited in galleries in New York, Washington, DC, Chicago, Los Angeles, and San Francisco. His mysticism is found in the center piece of the Sculpture Garden with his composition entitled “Cathedral”. Here you have the enormous architectual silouette of flying buttresses suggesting a cathedral arch and then at the suggested opposite end are “organ pipes”, below that the “organ” and “bench” and the “alter” and Eucharist. In 2002, his work graced the cover of The J. Peterman Company catalog, N0. 6, and various pieces of his work were illustrated for sale in subsequent catalogs. An opportunity of a lifetime for someone very special! The development of this unusual property is limitless. It begs the use of one’s own imagination! Perfect as a wedding venue; maybe simply as a retreat; workshops for artists; a stopover for Appalachian Trail hikers or for bikers along the Skyline Drive; additional B&B service by re-purposing some of the space or adding additional lodging units. Adjacent to the Shenandoah National Park, this unique Artist Estate is for sale, including all the original art and furnishing in the “church” building and the Sculpture Garden. Highlander Farmhouse - There can be only one! Motivated owners!! Inexpensive county taxes and easygoing county regulations. 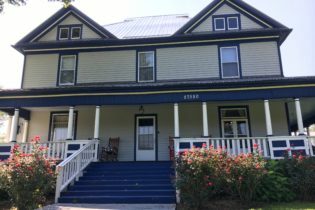 The wrap around front porch of this 5 bedroom, 5 bath Victorian Farmhouse, which was recently a successful and busy bed and breakfast, welcomes you home and beckons you to enter the front door. When you do, the wonderful wooden staircase greets you, and two living areas await you on either side of the large foyer. The owners quarters include one of the living rooms, and first floor bedroom and bath and an upstairs office area. The original hard wood floors and woodwork, milled from the property, gleam and two original fireplaces provide stunning focal points to each room. Walk farther through the foyer and enter the dining room with period mantel, built-in bookcase and chandelier dripping with crystals. Connected to the dining room though the original swinging door is the completely new kitchen. Here you will find a stainless KitchenAid wall oven, 60 inch Five Star gas double range, solid wood cabinets, quartz countertops, stainless dishwasher, extra deep stainless undermount sink, and French door refrigerator. Beside the kitchen, the updated laundry room has cabinets galore, long counter and large, farmhouse sink. Exit to the mud room and backyard or return to the kitchen to see the rest of the house, as the kitchen leads to the downstairs bedroom and bath, as well as to the upstairs via the back stairs. Up the back stairs you will find a large multi-purpose room, an upstairs foyer with closets to the ceiling, and 4 bedrooms with their own attached bathrooms. Don’t miss the beautiful stained glass window! Many new systems and improvements have been made to this home including new heating and cooling systems, 400 amp electrical service and septic system all new in 2014. Pex piping with distribution manifold, and new tankless gas water heater provide unlimited hot water on demand and no worries over burst frozen pipes. The home has approximately 3800 finished square feet and was substantially built about 1915 with most updates done between 2013 and 2015. The huge attic is unfinished but could provide for expansion if desired by the new owners. This exceptional property sits on 2.02 acres and includes a storage building and separate 4 car garage. Parking in the back includes a spot for an RV with 30 amp electrical hookup. The parking lot in the front has space for 5 cars. With low county taxes and an elevation of over 2200 feet above sea level , this is a great location. New outside paint and metal roof in 2018. Owners must sell due to health issues.